Following the recent unexpected withdrawal from service of small Prairie No. 5526 due to boiler cracks and the longer than planned repair of 57xx Pannier 5786, the South Devon Railway has hired former GWR 64xx Pannier No. 6430 to help run the line’s peak Summer services through July and August this year. 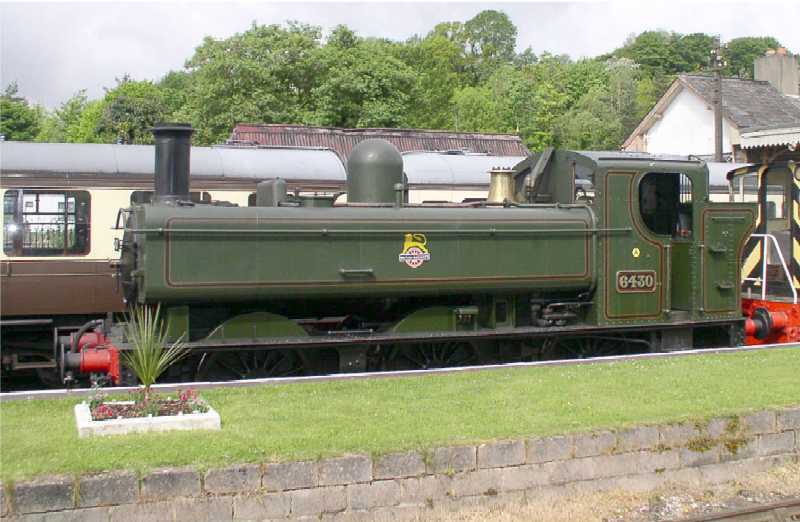 But the Llangollen Railway based engine is no stranger to Buckfastleigh having resided there for some 24 years from 1966-1990 after being bought from a South Wales scrapyard, but it never ran in Devon due to extensive motion damage suffered in British Railways service. Designed by GWR Chief Mechanical Engineer C.B.Collett and built at Swindon Works in 1937, No. 6430 is an ex GWR push-pull fitted pannier tank loco and ideal for working auto trains. The 40 members of the 64xx class were built between 1932 and 1937 and were seen on minor branch lines right across the Great Western system. After suffering some major damage, No. 6430 was withdrawn on 31st October 1964 and sent for scrap to John Cashmore Ltd but then bought for use as spares by the Dart Valley Railway. It was towed to Buckfastleigh by sister loco No. 6412 in 1966, a fellow survivor of the class which is now undergoing restoration in the SDRE Workshop. Bought as an incomplete kit of parts in 1990, the current owner painstakingly restored the engine to steam and it finally ran at Llangollen in 2004 some 40 years after last being in service. The loco will be a popular draw with visitors on the SDR and more than capable of handling the busy Summer traffic over the scenic line, inlcuding the July Military event and Rails & Ales weekend over the August Bank Holiday.